Politics is a dirty game. You can’t play and remain clean. If that sounds a little cynical, then perhaps The Ides of March is not for you. 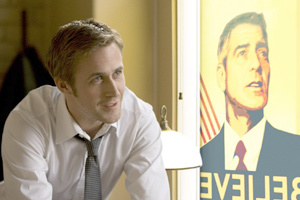 Ryan Gosling plays the assistant campaign manager (under Philip Seymour Hoffman) for Governor Morris (George Clooney), who is running for president. They are working in Ohio, trying to win the Democratic primary, the last big hurdle on the way to the White House. I wondered if The Ides of March were based on an actual campaign — perhaps Barack Obama’s since Morris’ campaign posters are in the style of Obama’s “Hope” poster. I learned afterwards that The Ides of March is inspired by Howard Dean’s campaign. Not that the specifics really matter to the story. The key to Ohio — the film’s MacGuffin — is the support of senator Thompson and his 300 delegates. Whoever wins Thompson’s support, wins Ohio, and likely the party’s candidacy and possibly the presidency. Paul Zara (Hoffman) advises the governor to promise a cabinet seat to Thompson. Morris tells Paul that he doesn’t honestly think the guy is cabinet material, and he rejects the deal, even though it means risking Ohio. That integrity is what Stephen Myers (Gosling) really seems to admire in Morris. Stephen is a true believer. He’s young, clean, eager, and unspoiled. The details of the script are smartly written and I won’t rehash them here. But The Ides of March, as you can guess from the title, is a film about political betrayal. It’s safe to say that Stephen’s young, unspoiled faith in American politics is put to the test, and worse, by the time the credits roll. The Ides of March is a political procedural along the lines of In the Loop, Primary Colors, and The Candidate. If this were an action movie, the political maneuverings would be the film’s action set pieces. What’s odd is that none of those set pieces are between the candidate and his rival, unless you count the clandestine meeting between Stephen and the opponent’s campaign manager. Most of the political intrigue is within Morris’ own campaign — between the advisors and Morris, between Stephen and Paul, and between Stephen and Morris. The Year of Ryan Gosling continues with Stephen as the film’s central figure. He’s old enough to have valuable experience, but young enough not to be jaded. Compare him to the decade-younger intern Molly Stearns (Evan Rachel Wood), whose naivete and inexperience are a liability to the campaign. Philip Seymour Hoffman’s Paul is maybe a decade older — just about old enough for his first heart attack. His extra time in politics tells him that loyalty is more important than skill. His counterpart in the opponent’s campaign is Tom Duffy (Paul Giamatti), who also uses his age and experience to politically attack Gosling’s youthful enthusiasm. But the old can’t defeat the young forever. The Ides of March shows how individual determination and ecological vacuums guarantee a Darwinian political cycle that favors ambition and survival over any moral system or individual. I don’t necessarily like cynical political movies such as this one or In the Loop. I think politics is dirty enough without having a filmmaker revel in it. But I do think there is an audience that enjoys the modern-day “game of thrones.” If you’re one of them, you’ll probably welcome The Ides of March. Maybe watching these fictional Democrats undermine each other will be a nice break from watching the real-life Republicans undermine each other. It’s cynical, yes. Those of us who don’t like it should probably stick to Mr. Smith Goes to Washington.